Bob Bishop is President and Founder of ICES Foundation (International Centre for Earth Simulation), a Geneva based not-for-profit organization chartered to bring together the multitude of specialised sciences that contribute to our knowledge of the global future. His career spans the world of technical, engineering, scientific and high performance computing – especially that of of digital modeling, simulation, and big data visualisation. Over a 40-year period, he built and managed the international operations for three well-known computer companies: Silicon Graphics Inc., Apollo Computer and Digital Equipment Corporation, rising to Chairman and CEO of SGI from 1999 to 2005<. 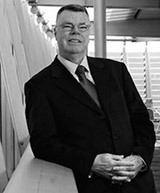 He is a Fellow of the Australian Davos Connection, an elected member of the Swiss Academy of Engineering Sciences and serves on the advisory boards for the EU Human Brain Project and NICTA (National ICT Australia). In 2006, Dr. Bishop was awarded the NASA Distinguished Public Service Medal for his role in building simulation facilities that helped NASA’s space shuttle fleet return-to-flight after the 2003 Columbia disaster.